What’s wrong with this picture?!?! So I wake up from a lovely night’s sleep, stretch my legs, scratch behind my ear and wait for Mom to announce it is coffee time. A few more cute puppy yawns as she carries me to the kitchen when Whoa! what do I see?!?! 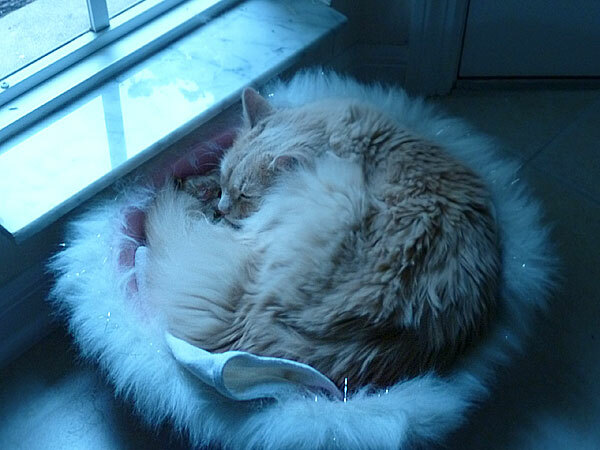 El Cato had appropriated one of my princess beds. And it is the one with primo real estate next to the window. Call the SWAT team! Call my agent!! I no theeeeenk so, Meester. 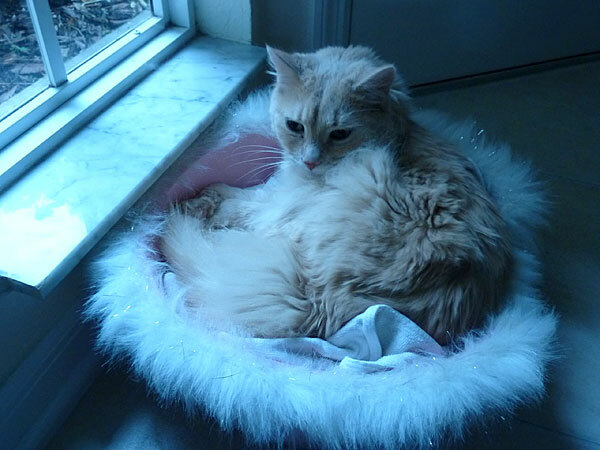 That lovely perch of pink satin and faux fur trim with little sparkles was clearly designed for my delicate self. Around these parts pink is MY color, Señor! Vamoose it and pronto, I thought. But worry not, amigos. Before I had to get all huffy and make a righteous stand, suddenly things turned back in my favor. You see, Mom saw Tigger sleeping there too. And she thought he looked so sweet and cuddly that she went straight for the camera. Click, click … Awww, simply lovely. Click, click … Oooo, so fluffy and sweet. Click, click … maybe another close up of her innocent little angel. 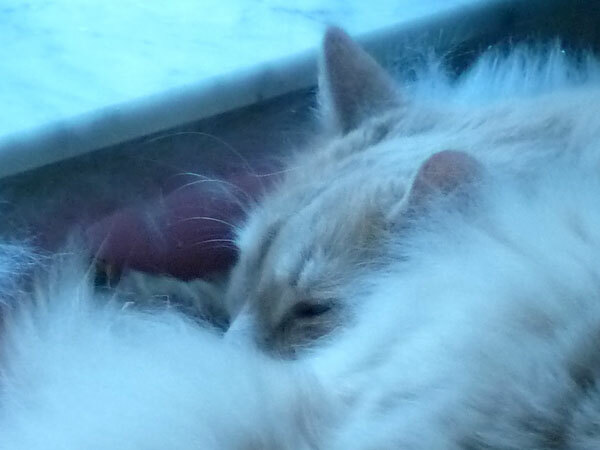 And el Kitty-Cato was sleeping so soundly and peacefully that at first he did not notice. But I saw my opportunity right away. Heh, heh – can you say blackmail pictures!!!! I kept really quiet and just watched. I’m such a helpful girl. Slowly it dawned on Señor Gato that there was something going on. He opened one eye. He squeezed, blinked and opened both eyes. It took a little while before he realized he was the subject of a full-blown photo shoot in a rather compromising situation – I mean, said fluffy, satiny, pink bed is not exactly ultra macho. Hmmmm ... maybe this was not such a good idea. Wait, oh, no!! there are pictures?!?!? Then WHOOSH! he blasted out of there muy pronto. Heh, heh, heh. Too late, Dude! The evidence is in and I know how to use it. I don’t think I have to worry about any of my strategically positioned, exquisitely comfy beds being desecrated with cato hair again anytime soon. La Chihuahua rules once again! 1. If they have not joined the cause, talk to your hairdressers and groomers about collecting the hair for mats that help contain the spilled oil in the Gulf. 2. 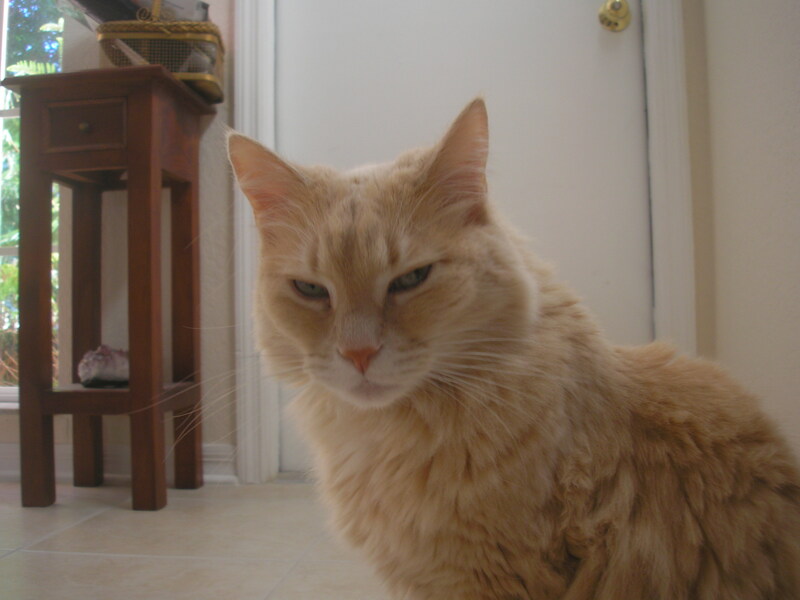 In your neighborhood as you are walking with other dogs, start a local movement to “Save the hairballs!” Fur real, I may not have a lot to offer in this endeavor, but Tigger and I are pooling together and saving our collective hairballs for the Gulf of Mexico efforts. 3. It is shedding season, at least it is in my living room. But then I live with Tigger who could put BigFoot to shame in the hair department. Let’s take advantage of the synchronism and save the tumbling hairballs in your homes when you sweep. 4. Brush often and give a little. Shiny soft coats are always in. You’ll look marvelous, darlings, AND help save lives. Like I said, I know you probably heard a lot about it yesterday on the blogosphere and twitterland, but I had to help keep the movement going. Trust me, you’ll hear from me on this again. Hopefully, I’ll sleep a little better tonight. With all the tossing and turning, Mom thought I was itchy and she gave me a bath this morning! I will admit, I was a little smelly and too “naturalle” but fur real at 7:30 a.m.?!?!?!?!? Not to worry, I fully exercised my revenge of the bath ritual all over her blanket!!!!! Revenge of the bath - crazy wet dog all over Mom's blanket!!! 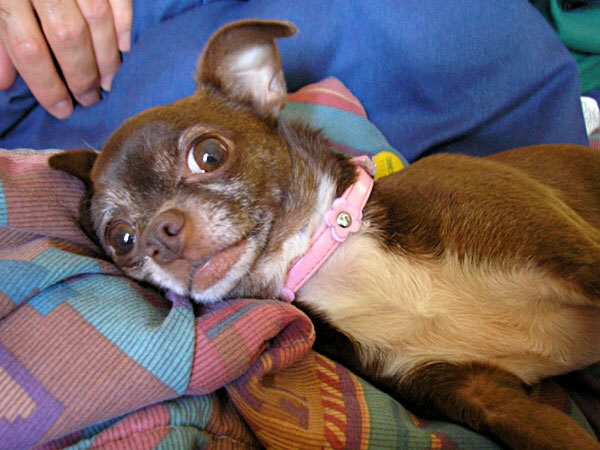 You are currently browsing entries tagged with hairballs at Chihuahua Wisdom Blog.